The summer is coming to an end and everything is burning with the colour of the coming Fall! In Italy the sensational Autumn will open in the North with a luxury taste: in Piedmont if you travel there for a little gourmet holiday, The International Truffle Fair Edition 2011 will satisfied your wish and wait for you until your arrival! Where? But in Alba! the town is famous worldwide for its white truffles, and the annual Truffle Festival is one of the greatest event for all the “buongustai” in Italy and abroad. Getting there is not that easy, as Alba is accessible only by car: go on the Torino-Piacenza highway to Asti, and then follow signs for Alba. Which is the programme? Firstly, on Sunday 25th September, Alba’s historical centre, that goes from Piazza Risorgimento to the end of the main street – Via Maestra- will open to a gorgeous wine festival: it will bring a taste of all wines the producers have to offer coming from both Langa and Roero regions. 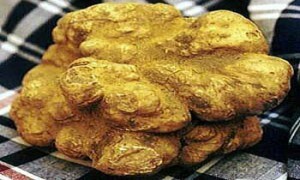 From 8/10 to 13/11 on Saturday and Sunday at Palatartufo the fab Alba White Truffle World Market is opening up! AlbaQualità will present also an exhibition of gourmet food and wine from Piedmont. Do not forget that if you come here the first Sunday of October is traditionally happening the Alba’s famous and traditional Donkey Palio. The Palio is a painted cloth and represents the prize for the winning jockey or donkey of the race, who in turn, represents one of the town’s nine boroughs. And to top it all The Truffle Bacchanal and The Village recalls its origins! On Saturday 15th and Sunday 16th October, you will a star in the Truffle Bacchanal and the The Village Recalls its Origins events, two very special ideas to get to know more about Alba’s incredible history and traditions. This old town is the “capital” of the hilly area of Langhe, and is famous for its white truffle, peach and wine production. This entry was posted on Saturday, September 24th, 2011 at 1:56 am	and is filed under Events in Italy. You can follow any responses to this entry through the RSS 2.0 feed. You can leave a response, or trackback from your own site.